The P4 Passive Speakers are perfect for stereo receivers, integrated amps, and tube amplifiers. The P4 passive speakers are perfect for digital hybrid amplifiers as well as stereo receivers, integrated amps, and tube amplifiers. 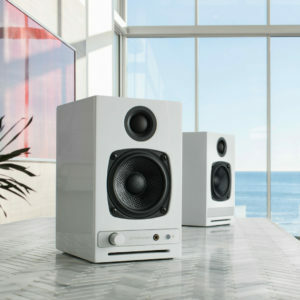 The P4 has a 4 ohm impedance rating but will sound great when connected to any receiver or integrated power amplifier with 4, 6, or 8 ohm speaker output impedance. The P4 is rated at 4 ohms but my receiver has speaker outputs listed as 8 ohms. Will the P4's work with my receiver? 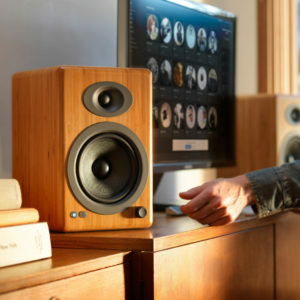 Why don't the P4 speakers have built in amplifiers similar to the A2 and A5 active systems? The P4 came about from requests from customers that already have our powered speakers and/or have a music system and needed speakers but wanted the same Audioengine sound from a passive speaker. 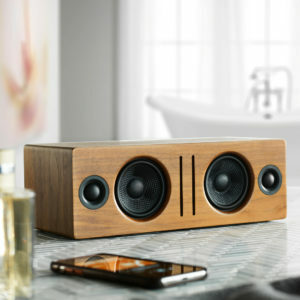 Is the bamboo version a veneer and does the P4 bamboo version sound better than the black or white finished cabinets? The P4 enclosure is made of solid carbonized bamboo, not a veneer. The bamboo cabinets were tuned to sound the same as the MDF speakers, but the density of bamboo will give it natural acoustic advantages over MDF material. What amplifiers work best with the P4? 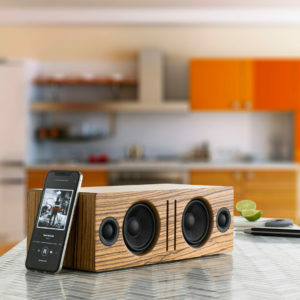 The P4 is a very efficient speaker and designed to work well with digital hybrid amplifiers (Class-D, Class-T, etc.) as well as most stereo receivers, integrated amps, tube amplifiers, and whole-house music systems such as the Sonos ZonePlayer 120. Check out our N22 amp for a great setup!